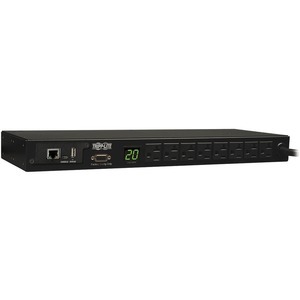 PDUMNH20 Monitored 1U Rackmount PDU supports 20A peak capacity at 120V (agency de-rated to 16 amps continuous). Includes attached L5-20P input cordset with 5-20P adapter and 8 5-15/20R outlets. Visual and remote current monitoring tracks real time output current level.